AFSC News: Why Are Baby Sea Lions So Skinny? Why Are Baby Sea Lions So Skinny? 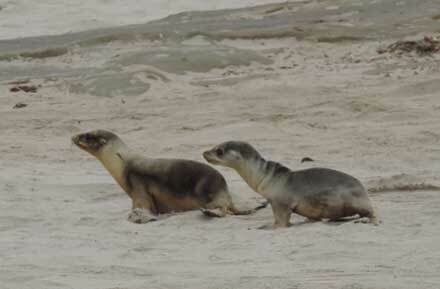 Two California sea lion pups, one fairly healthy, and one emaciated. New information from scientists with NOAA Fisheries’ Alaska Fisheries Science Center indicates that this year is likely to be another rough year for California sea lions. High numbers of pups on California’s Channel Islands, a primary breeding colony for this species in the United States, appear to be suffering from starvation. Scientists suspect a huge swath of unusually warm water along the California coast that is not rich in sea lion prey is forcing females to travel farther and stay away longer from their pups in search of food. Sea lions are opportunistic feeders but their core diet consists of Pacific sardines, northern anchovies, rockfish, Pacific hake and market squid, all of which are rich in fatty acids. As a result, young pups dependent on their mother’s milk to survive are not gaining weight and growing as they should at this time of year. Some pups may even be venturing off on their own in search of food. They end up stranding on beaches, weak and emaciated, and may be picked up by members of NOAA Fisheries’ West Coast Region Marine Mammal Stranding Network. California sea lions are found from Mexico to southern Canada and occasionally in southeast Alaska. During a six-week period from late May to the end of June each year, each female gives birth to a single pup. Typically, the pup stays with its mother, feeding off of her milk and, gradually, on small fish as it matures for nearly a year. The pup is solely dependent upon its mother until it is about six months old. However, it’s normal for a mother to leave her pup for short periods of time to feed on a variety of fish and cephalopods. The range of California sea lions extends from Mexico to southern Canada and sometimes beyond. NOAA Fisheries scientists have been studying sea lions on San Miguel Island in California's Channel Islands for 40 years. 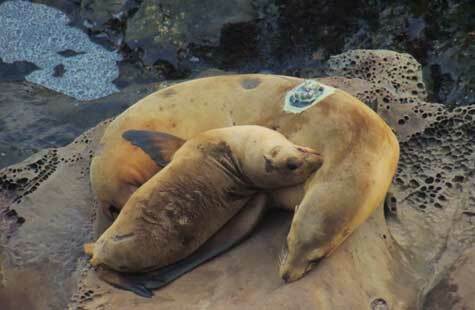 Nursing adult female sea lions tagged with satellite tracking devices provide information on movement and foraging behavior. “We’ve been measuring pup weights on San Miguel Island for 40 years. The weights we recorded during our research trip in September 2014 were much lower than we would normally see. In fact, the animals were 19% below the normal weight -- 31 pounds compared to a healthy pup, which weighs on average 38 pounds,” said Sharon Melin, wildlife biologist, NOAA Fisheries, Alaska Fisheries Science Center, National Marine Mammal Laboratory. While on the islands this past month, Melin and her team conducted a count of dead sea lion pups and weighed live pups to check on their condition. Mortality on the islands appeared to be low but the condition of the pups has continued to deteriorate over the past four months. As a result, Melin anticipates that large numbers of pups will likely strand on West Coast beaches in the coming months. An increase in sea lion pups has already started, with many stranding network facilities at or nearing capacity for treating stranded pups. The team also attached satellite tags to track movements of 12 adult females nursing pups. The information collected so far from the tagged females indicates that some mothers may be staying longer at sea in search of food, leaving the pups to fend for themselves. Interestingly though, some of the pups seen in 2013 and this year appeared to be fairly healthy, even chubby, suggesting that their mothers were having greater success locating food on their foraging trips. Listen to audio of February 18, 2015 press conference on California sea lion pup strandings and preliminary findings of current field research on Channel Islands.